The Steinberg-Long is a heavier-weight bassoon reed preferred by many experienced players. The higher cane density of this design gives a bassoon reed with plenty or heart and substance. The wide shape adds extra breadth to the tone and gives an easier low-note response. 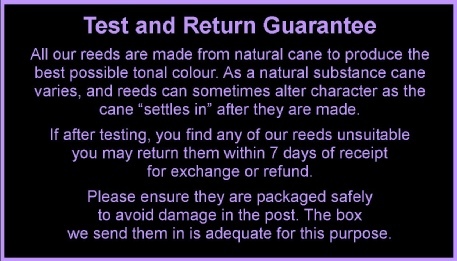 Overall these features combine to offer a substantial bassoon reed with a rich dark broad tone. The long tube length of this bassoon reed helps to lower pitch for players who find the standard reed plays a little sharp.